When artists and doctors work together, both sides win. There was a time before the camera and the microscope, before x-rays and MRIs, when doctors and artists needed one another. Achieving insight on the body’s form and function was a truly demanding challenge, and everyone was better off for the doctor-artist partnership. “Anatomy/Academy” Through April 17. Pennsylvania Academy of the Fine Arts, Philadelphia. This collaboration reached an apotheosis in Philadelphia during the late 1800s, when the city was a center of innovation for both fields. 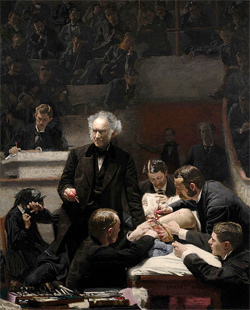 Well-regarded artists worked within walking distance of great medical innovators, and the proximity paid off. Sculptor William Rush carved “gigantic size” anatomical sculptures of small parts of the body — the inner ear, sphenoid bone, temporal bone, the right maxilla — which anatomist Caspar Wistar used as models when lecturing in the medical school amphitheater.